So here's the deal - tickets are $1.00 - the blanket is a generous double bed size (seen here on a Queen size bed) . The raffle will be drawn on July 1st - so you have a little over 3 weeks to get your money in! It is open to both Australian and overseas residents - I will personally pay for postage if you live outside Australia and you win!! Email me at No1grandma@gmail.com if you want more information too! PLEASE - just $1.00 for a ticket is not much to find for such a worthy cause....it is very close to my heart right now, as I have a young friend in her twenties who has it, her mother has all symptoms and at the age of 50 , cannot speak, walk, feed herself, or look after herself and is in fulltime care. My young friend has three young children who stand a 50% chance of inheriting it too. 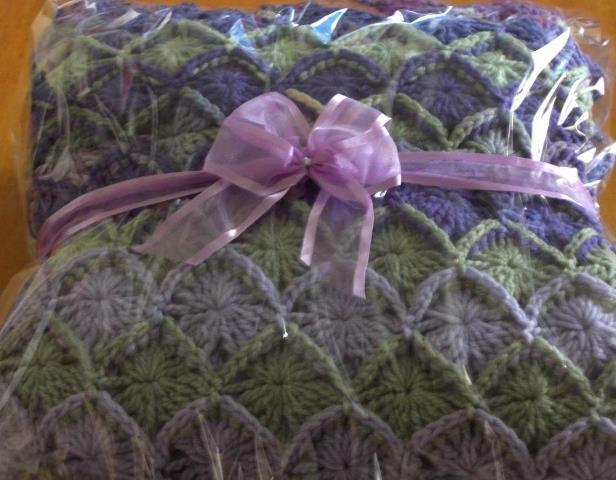 If you can spare one dollar - then please contact me... and you just might win this lovely hand made blanket for $1.00! !